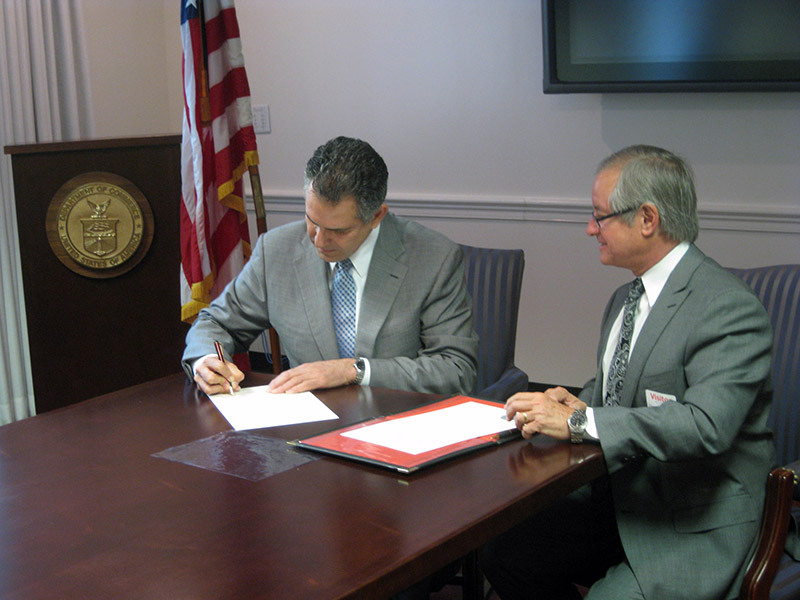 Francisco Sánchez (left), under secretary of commerce for international trade, and Manny Mencia (right), president of the State International Development Organizations, sign a memorandum of intent in Washington, D.C., on September 7, 2011. The agreement provides for increased cooperation on export promotion programs. (U.S. Department of Commerce photo). by U.S. companies that want to enter foreign markets. Francisco Sánchez, under secretary of commerce for international trade, and Manny Mencia, president of SIDO, signed the memorandum at a ceremony held in Washington, D.C.
SIDO is a nonprofit affiliate organization of the Council of State Governments that represents the trade promotion organizations of U.S. state governments as well as Puerto Rico and the District of Columbia. According to a 2009 report by the Government Accountability Office (GAO), more than three-quarters of state trade offices view ITA’s export promotion services as “very” or “moderately” important to their states’ export promotion capabilities. The GAO report also found that most states already rely on or partner with ITA to obtain export assistance in overseas markets where the states have no representation. The new agreement will build on this relationship through a variety of means, including regular consultations between ITA and SIDO, enhanced partnership activities, and identification of opportunities that increase awareness of ITA’s export promotion services.